This year promises to be a noteworthy year in food safety. 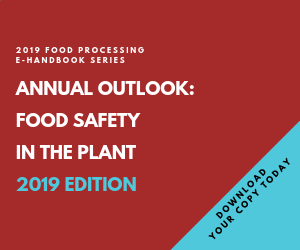 The regulatory outlook for 2012 is dominated by the Food Safety Modernization Act (FSMA), and July will be a particularly important month for food safety, as many important provisions of FSMA either become effective or require regulations to be implemented at that time. The FDA will be consumed with implementing the act. FSMA requires FDA to move from a food safety approach that reacted to potential harm after an outbreak or a finding of adulteration to a preventative framework that identifies potential threats to the food supply and acts to counter them before any harm occurs. Establishing standards for science-based preventive controls from "farm to table." Achieving high rates of compliance with those standards. The centerpiece of FDA's new approach is the hazard analysis, risk-based preventative controls in Section 103 of FSMA. Section 103 requires each registered facility, with some exceptions, to evaluate, identify and develop a written analysis of known or reasonably foreseeable hazards that could affect food manufactured, processed, packed or held at the facility, including hazards that occur naturally or may be unintentionally introduced, as well as intentionally introduced hazards. Once a hazard is identified, the facility must apply preventive controls, including at critical control points, to minimize or prevent the hazard and to assure FDA that the food will not be adulterated or misbranded for failure to declare a major food allergen. Registered facilities must also periodically re-evaluate potential hazards, monitor the effectiveness of the preventative controls, establish corrective actions and verify the effectiveness of their activities. Eric Lindstrom is counsel in the San Francisco office of law firm Keller and Heckman LLP (www.khlaw.com). He can be contacted at lindstrom@khlaw.com. Not only do the provisions of Section 103 become effective in July 2012, but also by that date FDA must promulgate regulations to establish science-based standards for the development and implementation of the required preventive controls. FDA is additionally required to issue regulatory guidance regarding these regulations. Also by July 2012, under FSMA section 106, FDA must promulgate regulations to protect against intentional adulteration of food. The regulations will be limited to foods for which there is a high risk of intentional contamination that could cause serious adverse health effects or death. In addition, the regulations must be product specific, and will not apply to food produced on farms, with the exception of milk. And FDA must promulgate by July 2012 regulations under FSMA section 111 regarding sanitary food transportation practices to ensure that food is not transported under conditions that may render the food adulterated. Also by July 2012, FDA may require under FSMA section 211 that "responsible parties" for purposes of the Reportable Food Registry – Food, Drug and Cosmetic Act section 417 – report "consumer-oriented" information regarding a reportable food. Such information could include, among other things, a description of the food; affected product identification codes; and contact information for the responsible party. A standardized one-page summary of this "consumer-oriented" information must be prepared by FDA and published on the agency's website. Once FDA establishes the preventive controls and other related rules, it will ensure a high level of compliance by increasing the frequency of inspections, with a focus on food safety risk. FSMA section 201 requires FDA to allocate food inspection resources based on the risk profile of the food facility, with all domestic high-risk facilities to be inspected by 2016. A facility is determined to be "high risk" by consideration of a number of factors, including the known safety risks of the food at issue, the compliance history of the facility and the rigor and effectiveness of the facility's hazard analysis and risk-based preventive controls, among others. All "high-risk" domestic food facilities must be inspected by January 2016, and at least once every three years thereafter. All domestic food facilities determined to be not "high risk" must be inspected by 2018, and at least once every five years thereafter. It is expected that these more frequent inspections will be further in place in 2012, depending on the availability of FDA resources. FDA's mandate to increase the number of inspections also extends to foreign food facilities that produce food imported into the U.S. During 2011, FSMA required FDA to inspect no fewer than 600 foreign food facilities and double those inspections every year for the next five years.